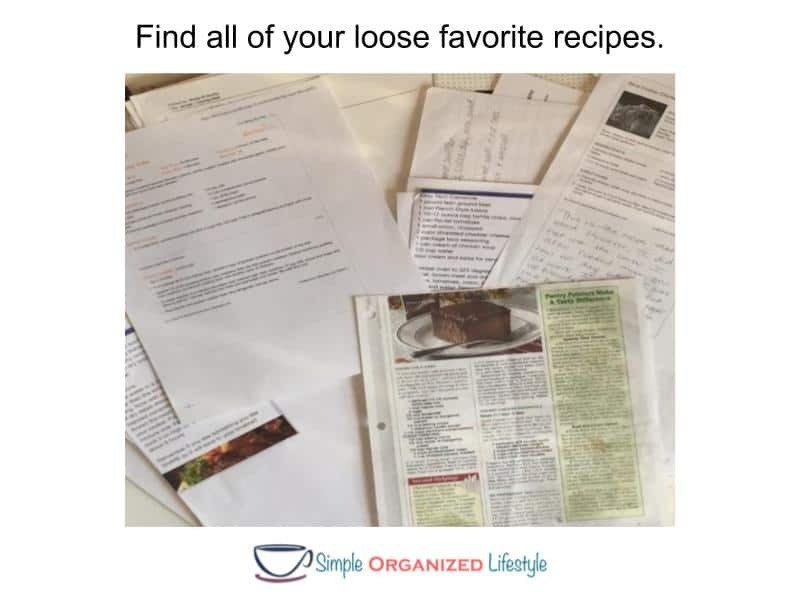 Do you have a collection of loose hand-written or printed favorite recipes that need to be organized? 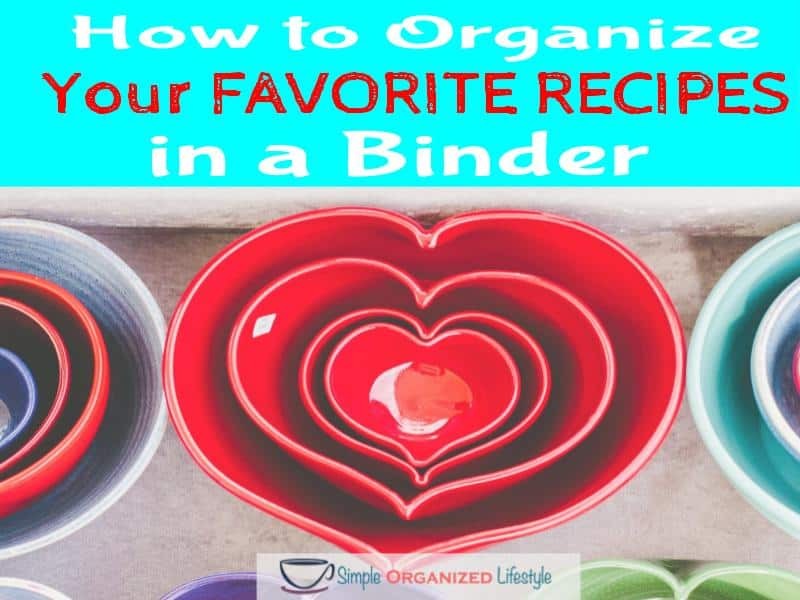 Below is a simple method for how to organize those favorite recipes in a three ring binder. It saves time from searching and paper from re-printing favorite online recipes when you can’t find them. 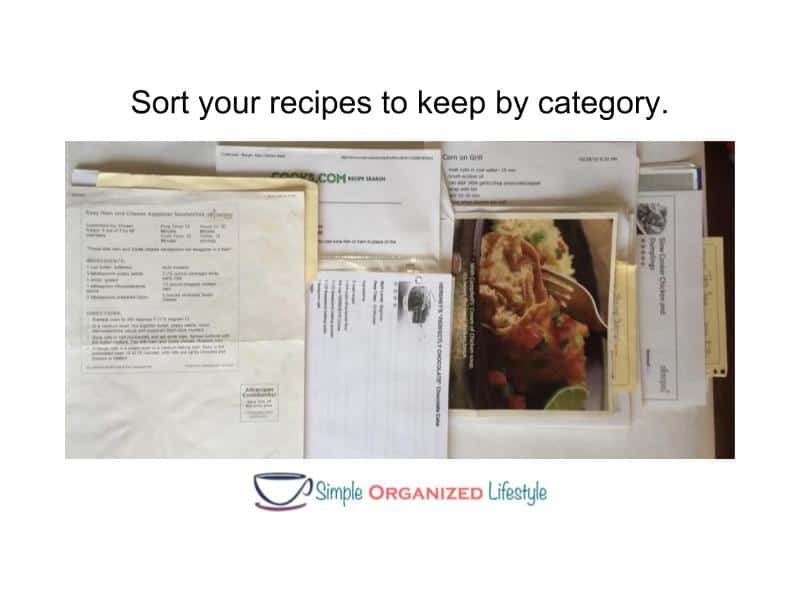 First, find all of the loose recipes that you want to organize. They may be folded in other recipe books, in file folders, or in kitchen drawers. Just put them all in one place. Here’s my assortment of loose recipes from family, magazines, online sources (allrecipes.com is my favorite) you name it! Next, sort according to the recipe category- one for appetizers, another for main dishes, side dishes, desserts and so forth . As you are sorting, toss out duplicate recipes and recipes you’re never going to make (chocolate chip pumpkin bread sounded delicious but not quite my skill set so that one and several others were recycled)! If you have a printer at home, make a copy of your most used and loved recipes that have become torn and tattered. Set up the notebook binder by adding the sheet protectors and dividers. The sheet protectors are great for pulling out a recipe when you need it and simply wiping it off if you have a spill. Put your recipes down in the sheet protectors and then add to the category that fits. 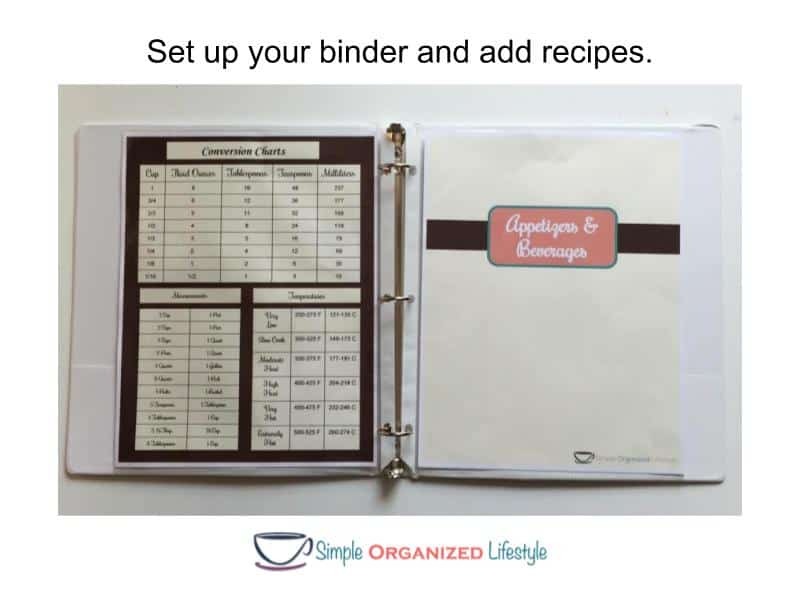 If you do not already have a link to my Resource Library, feel free to grab it here and download the set of recipe binder printables shown above, including a cover page as well as a measurement & conversion chart. 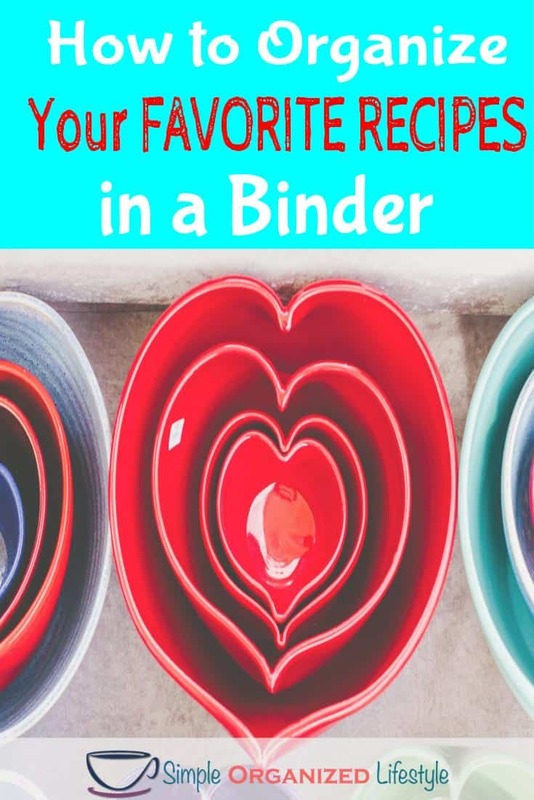 You may want to add a category to make the binder work best for the type of recipes that you have. For example, you might have a “favorite holiday recipes” where you keep recipes that you make each year or a “favorite crock pot” section- see my Taco Soup post if you don’t already have this one in your collection! I have a binder of all my favorites too. It’s SOOO handy. I even print off our go to Pinterest favorites so I don’t have to deal with finding them every time. Great idea. I actually have a bunch of recipes in a binder but I need to put them in sheet protectors since I’m such a messy cook! Me too! Much easier to wipe them off:] Thanks Julie! Hey Miranda, I did this a couple of years ago, and it is my go-to binder that sits on my counter. A tablet is good for Pinterest recipes, but who wants to get food all over their electronics?! Also helps to Keep all of those scraps of paper in one location. Great idea. I totally agree about the electronics, too risky with my cooking anyway:] Thanks Deneen! Those hand-written recipes by various family members are so special. Thanks Miranda!